It started with Felicity contacting The Shropshire Express & Star but now this fireball extravaganza of a Marryoke we made has been featured on The Mail Online, The Mirror Online and even reached a Danish news site! 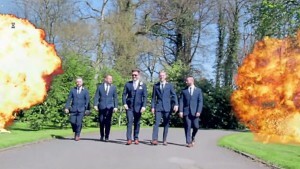 If you haven’t already seen it their Marryoke to 5ive’s ‘If Ya Gettin’ Down’, filmed during their wedding at stunning Haughton Hall then catch it here and ... enjoy! PS Some great photos of the Marryoke also taken by Amrose Photography.